A lot of people dread August because it's when every company begins their Back to School promotions. But don't think about the homework or the projects, think about the back to school shopping! 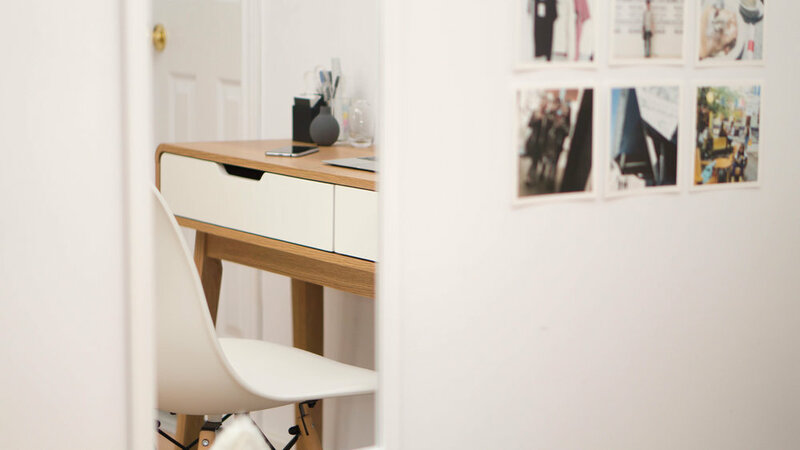 But in this post, I'm switching it up by pressing pause on the B2S lookbooks and instead, I have teamed up with Canadian Tire as part of their Back to School campaign to give you some tips on how to update your room/workspace to maximize productivity. 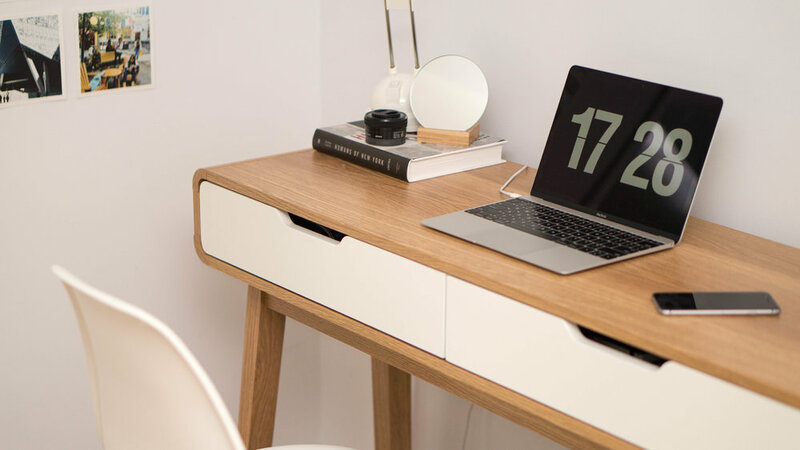 The first step to creating a workspace that you'll want to work in is choosing a desk. 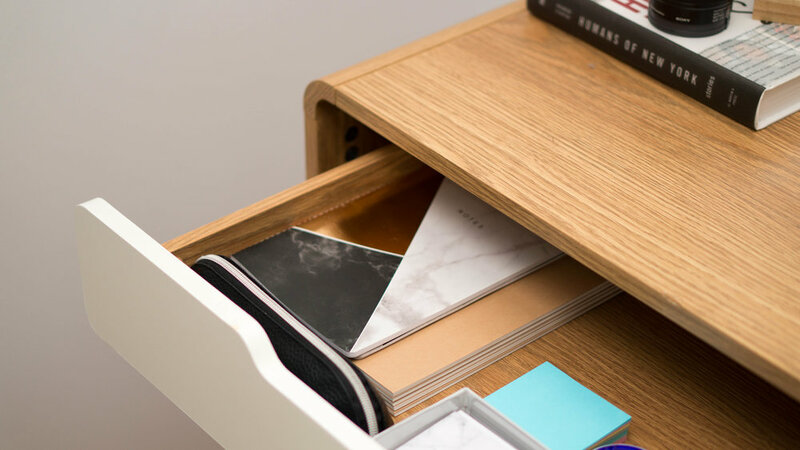 As part of their Back to School campaign, Canadian Tire sent me the CANVAS Oslo Console Desk, which I am absolutely obsessed with! This desk is obviously the central part of the work area in my room and it's the piece I used to ground all the other elements and pieces. It has a wooden finish with white drawers and the rounded edges give it a very modernistic, art deco vibe. Canadian Tire also sent me the CANVAS Nolo Basket (similar one here). This basket is perfect for storing textiles like pillows and throws, making those comfortable, cozy items accessible for those rough, late study nights. Now, because I'm extra, I decided that this would be the perfect opportunity to create the ultimate workspace. So, I went to my local Canadian Tire to buy some more pieces that would really perfect the look and feel of this space. First, I picked up this loft rug — also by CANVAS and on sale for $15 — which helps section off and define the workspace. Adding a rug to your room almost creates a room within a room illusion by allowing your eye to define the pieces around it as one section. Because a lot of pieces in my room from before I started changing things up are black, white, and grey, the grey loft rug helps tie in those cooler tones with the new warmer ones. Next, we have the chair. I noticed that the desk on the Canadian Tire website was paired with the CANVAS Henrik Chair in white, which also happens to be on clearance! So, I jumped at the chance to complete the look. This is such a beautiful, minimalist chair and I love the structural elements at the bottom! Get ready for lots of aesthetic Instagram photos featuring this chair, haha! Lastly, I picked up a 14x50 inch door mirror for only $10 (and that's regular price)! I have been looking for a full-length mirror for so long, but even the most basic ones at IKEA seemed overpriced. Although this one from Canadian Tire is meant to be hung on a door, it still works fine placed on a wall. It is plastic and the reflection has a little bit of distortion, but for $10, I can't complain. Placing a mirror, or other reflective elements, into your room extends the space and adds depth! Be sure to check out Canadian Tire for all your back to school essentials, especially when it comes to updating your workspace! Good luck to everyone going back to school/work! Disclaimer: The desk and basket were provided by Canadian Tire. All opinions are my own.